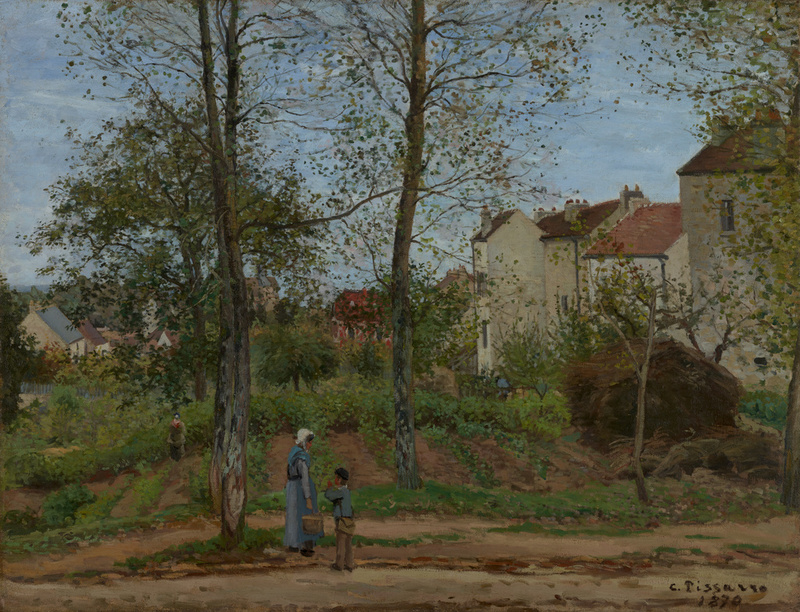 Lower right: "C. Pissarro / 1870"
Within a few hundred yards of his home, Camille Pissarro painted a view of peasants working in a shady, wooded garden alongside a group of village houses. In the foreground, a woman carrying a bucket pauses to talk with a young boy carrying his school satchel over his shoulder. The gray sky and the trees losing their leaves indicate that it is autumn. Painting in the open air alongside Claude Monet and Pierre-Auguste Renoir, Pissarro followed a new practice of breaking up surfaces with loosely placed brushstrokes. This revolutionary technique, the cornerstone of Impressionism, helps to reveal how light and movement affect the perception of objects. Pissarro made the canvas a field of textures and movement; the character of the brushstroke varies according to the texture and form of the object it describes. For example, the haystack is painted with straw-shaped brushstrokes, the leaves are suggested by jagged daubs of paint, and the stucco walls are depicted with broad, smooth strokes. Durand-Ruel & Cie, consigned by the artist, 1873; sold to P. A. B. Widener, 1891. Peter Arrell Brown Widener, 1834 - 1915 (Elkins Park, Pennsylvania), sold to Durand-Ruel & Cie, 1906. Durand-Ruel & Cie (New York, New York; Paris, France), sold to Mme. Henri Goldet, 1934. Source: JPGM Paintings Department, curatorial files, letter from Caroline Durand-Ruel Godfroy, January 23, 2001. Mme Henri Goldet, by inheritance to Roger Goldet. Brame-Lorenceau (Paris, France), sold to the J. Paul Getty Museum, 1982. Explication des ouvrages de peinture, sculpture, architecture, gravure et lithographie des artistes vivants exposés au Palais des Champs-Élysées, le 1er mai 1870, exh. cat. (Paris: Charles de Mourgues frères, 1870), p. 299, no. 2290 (possibly Getty painting). Yerkes, Charles T. Catalogue of Paintings Forming the Private Collection of P. A. B. Widener [...] Part 1. Modern Paintings (Paris: Goupil & Co., 1885-1900), no. 89. Catalogue of Celebrated Paintings by Great French Masters [...], exh. cat. (New York: National Academy of Design, 1887), p. 42, no. 170. Catalogue of the Eleventh Annual Exhibition at the Carnegie Institute [...], exh. cat. (Pittsburgh: Carnegie Institute, 1907), unpaginated, no. 375. Special Exhibition of Paintings by the Masters of the Modern French School, exh. cat. (Washington, DC: Corcoran Gallery of Art, 1911), unpaginated, no. 30. Official Catalogue (Illustrated) of the Department of Fine Arts, Panama-Pacific International Exposition [...], exh. cat. (San Francisco: Wahlgreen, 1915), p. 58, no. 2819. Exhibition of Paintings by Modern French Masters, Lent by Durand-Ruel Galleries, New York City, exh. cat. (Worcester, MA: Worcester Art Museum, 1917), unpaginated, no. 14. Paintings by Modern French Masters [...], exh. cat. (Columbus, OH: Columbus Gallery of Fine Arts, 1924), unpaginated, no. 29. Centenaire de la naissance de Camille Pissarro, exh. cat. (Paris: Musée de l'Orangerie, 1930), no. 8bis. Manson, J. B. "Camille Pissarro, 1830-1930." The Studio 99, no. 447 (June 1930), p. 414, ill.
Neugass, Fritz. "Camille Pissarro." Deutsche Kunst und Dekoration 67 (December 1930), pp. 154, 157, ill.
Venturi, Lionello, and Ludovic Rodo Pissarro. Camille Pissarro: Son art, son oeuvre (Paris: Paul Rosenberg, 1939), vol. 1, p. 91, no. 87; vol. 2, pl. 17, no. 87. Exposition Camille Pissarro, organisée au profit de la Société des Amis du Louvre, exh. cat. (Paris: Galerie Durand-Ruel, 1956), unpaginated, no. 8, ill.
C. Pissarro, 1830-1903, exh. cat. (Paris: Durand-Ruel, 1962), unpaginated, no. 1, ill.
Sotheby's, London. Catalogue of Important Impressionist and Modern Paintings. December 5, 1979, unpaginated, lot 15, ill.
Art at Auction: The Year at Sotheby Parke Bernet (1979-1980), p. 98, ill.
"Principales acquisitions des musées en 1982." La Chronique des arts: Supplément à la Gazette des beaux-arts, 6th ser., 101, no. 1370 (March 1983), p. 42, no. 233, ill.
Schaefer, Scott, et al. A Day in the Country: Impressionism and the French Landscape, exh. cat. (Los Angeles: Los Angeles County Museum of Art, 1984), pp. 80, 90, 93-94, no. 16, ill., entry by Richard Brettell. Robinson, Susan Barnes, ed. The French Impressionists in Southern California: Paintings, Sculptures and Prints in Public Collections; A Guidebook and Catalogue (Los Angeles: Loyola Marymount University, 1984), pp. 60, 62, ill.
Laclotte, Michel, et al. L'Impressionnisme et le paysage français, exh. cat. (Paris: Galeries nationales du Grand Palais; Editions de la Réunion des musées nationaux, 1985), pp. 68, 80-81, no. 16, ill., entry by Richard Brettell. Fohr, Robert. Review of L'Impressionnisme et le paysage français. Grand Palais, Paris. Universalia (1986), p. 480, ill.
Fredericksen, Burton B. Masterpieces of Painting in the J. Paul Getty Museum. Rev. ed. (Malibu: J. Paul Getty Museum, 1988), unpaginated, no. 41, ill.
Pissarro, Joachim. Camille Pissarro (New York: Rizzoli International, 1992), unpaginated, pl. 3. Pissarro, Joachim. Camille Pissarro (New York: Harry N. Abrams, 1993), pp. 66, 68-69, fig. 65. Pissarro, Joachim, and Stephanie Rachum. Camille Pissarro, Impressionist Innovator, exh. cat. (Jerusalem: The Israel Museum, 1994), p. 99, no. 28, ill.
Roux, Paul de. Pissarro: Villes et campagnes (Paris: Herscher, 1995), pp. 22-23, ill.
Jaffé, David. Summary Catalogue of European Paintings in the J. Paul Getty Museum (Los Angeles: J. Paul Getty Museum, 1997), p. 97, ill.
Shiff, Richard. "Natural, Personal, Pictorial: Corot and the Painter's Mark." In Barbizon: Malerei der Natur-Natur der Malerei. Andreas Burmester, Christoph Heilmann, and Michael F. Zimmermann, eds. (Munich: Klinkhardt & Biermann, 1999), pp. 132-33, fig. 8. Maloon, Terence, et al. Camille Pissarro, exh. cat. (Sydney: Art Gallery of New South Wales, 2005), pp. 84-85, 87, 91, 249, no. 11, ill.
Pissarro, Joachim, and Claire Durand-Ruel Snollaerts. Pissarro: Critical Catalogue of Paintings. 3 vols. (Paris: Wildenstein Institute, with Skira, 2005), vol. 1, p. 126; vol. 2, pp. 140-41, no. 157, ill.
Maloon, Terence, and Claire Durand-Ruel Snollaerts. "Pissarro and His Critics." In Camille Pissarro, exh. cat. (Sydney: Art Gallery of New South Wales, 2005), pp. 229-31. Rothkopf, Katherine, et al. Pissarro: Creating the Impressionist Landscape, exh. cat. (Baltimore: Baltimore Museum of Art, with Philip Wilson Publishers, 2006), pp. 112-13, no. 19, ill., entry by Gülru Çakmak. Rothkopf, Katherine. "Camille Pissarro: From Barbizon Student to Impressionist Innovator." In Pissarro: Creating the Impressionist Landscape, exh. cat. Katherine Rothkopf et al. (Baltimore: Baltimore Museum of Art, with Philip Wilson Publishers, 2006), pp. 42, 54, ill.
House, John. Review of Pissarro: Catalogue critique des peintures / Critical Catalogue of Paintings, by Joachim Pissarro and Claire Durand-Ruel Snollaerts. The Burlington Magazine150, no. 1262 (May 2008), p. 333. Brettell, Richard R. Pissarro's People, exh. cat. (Williamstown: Sterling and Francine Clark Art Institute; San Francisco: Fine Arts Museums of San Francisco, 2011), pp. 25-26, fig. 10. Brettell, Richard R. "Pissarro and Anarchism: Can Art be Anarchist?" In Pissarro, exh. cat. Guillermo Solana, et al. (Madrid: Museo Thyssen-Bornemisza, 2013), pp. 60-61, 69n5, fig. 26. Finckh, Gerhard, ed. Camille Pissarro: der Vater des Impressionismus (Wuppertal: Von der Heydt-Museum, 2014), pp. 234-35, ill.